We have lots of great events coming up this month at the library! 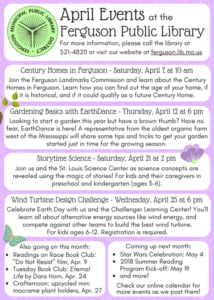 April 7, Century Homes in Ferguson, 10-12 pm: The Ferguson Landmarks Commission will be on hand to share information about the Century Home program in Ferguson. Learn how a home can qualify to be plaqued as a Century Home, how you can find out more information about the historic homes in Ferguson, and more. April 9, Readings on Race Book Club, 6 pm: This month, the Readings on Race Book Club will watch and discuss the documentary “Do Not Resist,” about the militarization of police forces around the country. Attendees are also encouraged to read the book The Rise of the Warrior Cop by Radley Balko for further background information, but it is not required. All are welcome! April 12, Gardening Basics with EarthDance, 6 pm: Need help getting your garden started this spring? Looking to start a garden for the first time? Crystal from EarthDance will teach us how to get our plants in the ground and thriving, all summer long. April 19-21, FLIERS Spring Book Sale: Come by the library to stock up your shelves with good books at great prices! All proceeds go to benefit the library. April 21, Storytime Science with the St. Louis Science Center, 2 pm: Enjoy a science-themed storytime with us and the St. Louis Science Center! For kids aged 3-6 and their caregivers. An adult must be present during the program. April 24, Tuesday Night Book Club, 5 pm: Looking to spice up your reading? Consider joining the Tuesday Night Book Club! This month, we will read and discuss Eternal Life by Dara Horn, which focuses on a woman who traded her death for her son’s life 2000 years ago. After living countless lives, she now looks for a way to end it all. April 25, Wind Turbine Design Challenge with the Challenger Learning Center, 6 pm: Learn all about alternative energy with us and the Challenger Learning Center! Participants will have a chance to team up and compete against others to design the best and most efficient wind turbine. For kids ages 6-12. Space is limited – registration is required. Contact us at the library to sign up today! 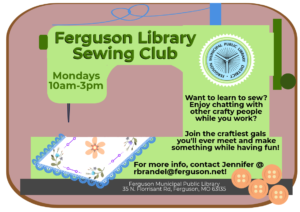 April 27, Crafternoon, 5 pm: Did you know that we have a monthly craft program just for adults? Each month we tackle a new project as we craft our way into the weekend. Best of all, it’s free, and we provide all of the supplies! Join us this month to make mini macrame plant holders from upcycled materials. Registration is required. Contact us today to sign up!